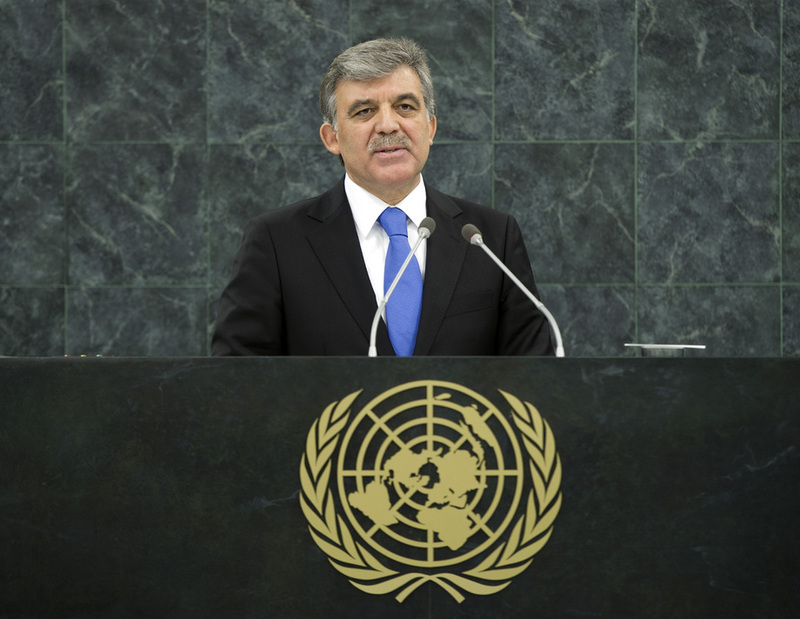 ABDULLAH GÜL, President of Turkey, recalled that, at the dawn of the twenty‑first century, there was every reason to be optimistic about the future, as the world’s “moral balance” had shifted towards the pursuit of peace. States had understood the imperative of working together for a stable world order and, in a spirit of cooperation, developed effective international responses to the scourge of terrorism. Yet, the most profound crises were emerging from internal conflicts, which were on the rise and driven largely by the problem of political legitimacy. “Leaders without political legitimacy share a common delusion,” he said. “Instead of reading the future and leading transformation, they believe they can buy time with irresponsible actions against their own people.” Domestic conflicts escalated into civil wars, such as in Syria, and the actions of those leaders carried implications for peace and security beyond their borders. Domestic peace was the key to regional and international peace — a challenge all nations would face. The world needed a strong, credible United Nations able to force perpetrators of brutal actions to submit to justice and the rule of law. He called for a Security Council that was democratic, effective and accountable. Focusing on Syria, he firmly supported the United States-Russian Federation agreement to eliminate that country’s chemical weapons arsenal, stressing that the accord must now translate into a tangible Security Council resolution. Turkey would welcome the complete and verifiable destruction of those weapons, especially as they had been used against Syrian civilians just a month ago. The perpetrators of that crime against humanity must be brought to justice and the agreement on Syrian chemical weapons provided an opportunity to do so, which he hoped would be a first step in creating a security architecture that ensured their total elimination in the Middle East. “This conflict neither began with the use of chemical weapons, nor will it end with an agreement to eliminate them,” he said, rejecting as immoral any position that was not troubled by the killing of innocent people. It was a disgrace that the Council had failed to uphold its primary responsibility in that case, and further, that “balance-of-power politics” had prevailed over the imperative to end that tragedy. “I cannot emphasize this enough,” he said. “Agreement on chemical weapons must not be allowed to substitute for a comprehensive political strategy to address the situation in Syria.” Further, he said, once extremists took root in a State, they formed autonomous structures and threatened security at home and abroad. He also argued for a sound strategy with well-defined, well-calculated objectives for a peaceful solution, which aimed to end the civil war and ensure a stable transition. “We cannot and shall not leave the Syrian people to their fate,” he said, urging the creation and enforcement of a political strategy, led by the “P5” and neighbouring countries. Turning to the broader Middle East, he said advances in the region, including in Tunisia, Libya and Egypt, were irreversible, but the world should not expect emerging political systems to transform into mature democracies overnight. On the Palestinian question, he said denial of Palestinians’ right to a State of their own could not be justified, with illegal settlements on Palestinian land undermining the prospects for a two-State solution. Strongly supporting talks initiated by the United States, he said their success depended on Israel’s acceptance of the creation of a viable Palestinian State, as well as a unified Palestinian front. More broadly, he said Turkey was fully committed to finding a just and negotiated settlement to the Cyprus question, and expected the international community to urge Greek Cypriots to reciprocate by engaging in result-oriented and time-framed negotiations. He strongly urged peaceful resolution of the Nagorno-Karabakh conflict and achievement of sustainable peace in the Caucasus based on territorial integrity. Turkey had proposed a strategy for regional economic cooperation and development, combined with the gradual withdrawal from occupied territories, which could provide a solid basis for regional peace. In the Balkans, Turkey had worked to build strong ties with all Balkan nations. On Afghanistan, he had led efforts to establish the Trilateral Summit Process among Afghanistan, Pakistan and Turkey. Finally, he said terrorism could be defeated only when States stopped making “my terrorist/your terrorist” distinctions. Islamophobia sought to make an imaginary enemy of the millions of peace-loving Muslims. Rather, a balance must be struck between freedom of expression and respect for faith. He also discussed Turkey’s assistance and direct investment package to least developed countries. If elected to the Security Council for 2015-2016, Turkey would bring an independent voice to that body. In sum, he believed democracy, rule of law, respect for human rights and global welfare would continue to expand in the new millennium.